Angie Payne, a multi-time national bouldering champion and the first woman to climb V13, recently took a break from bouldering to go on an adventure with expedition climber Mike Libecki. Together they climbed her first big wall, the 3,264-foot rock spire called Poumaka on an island in French Polynesia. 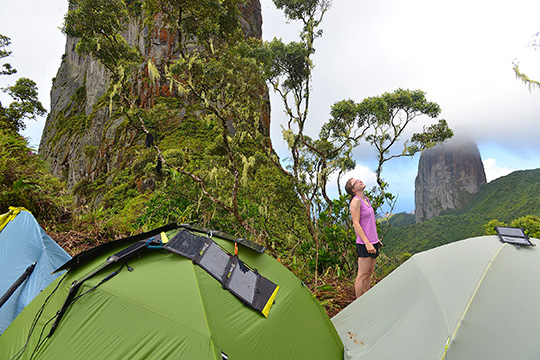 Here, she traded the dusty rock gym and dry, high-mountain boulders for sketchy belays, wet cracks and muddy jungle. "I am as much a gym rat as I ever was," writes Payne on her blog, "although I am admittedly involved in a series of ongoing affairs with real rocks as well." Check out Chris Van Leuven's conversation with Payne about her experience on Poumaka below—Ed. I understand you're known mostly as a boulderer and competition climber. How long have you been competing? I've done the competition thing for a long while now, like 18 years. I was on the youth circuit from age 12 through 15 or 16, and then I did the PCA [Professional Climbers Association] comps. I started as a sport climber and switched to bouldering at 15-16. I moved to Boulder, Colorado, from Cincinnati, Ohio, in 2003 for college and never left. I saw you compete in the Battle of Bubble in Boulder in 2009. Tell me about your experience. I'd hurt my ankle pretty badly before that, and had to have ankle surgery. It was a long, drawn-out process of healing. That was the first [comp] I did after coming back. Alex Puccio got first, and I got second. It was a head-to-head format at the end. We alternated back and forth before someone did it. I kept botching the last move, and she did it. It was a heartbreaker. Still, I was really psyched to be climbing again. Tell me about your first trip with Mike Libecki, to Greenland in 2012. I went there that August with Mike and Ethan Pringle and Keith Ladzinski. We didn't really know what would happen because we only had two weeks and our location changed. The sea ice wasn't in the right condition to get the boat through—the captain wouldn't take us there. We ended up heading somewhere else. Did you have any experience in aiders prior to Greenland? I had no big wall experience. And Ethan had very little experience. We tried to do this ridge route to the top of a tower and got rained out. [Then] Mike and Ethan tried to climb this tower and they thought it was too sketchy for me to join them—which I agreed with. Ethan bouldered with me for one day, then I was on my own the rest of the time. There were quite a few days that I bouldered alone, or with Keith spotting me and taking photos. He really saved that trip for me. Without Keith, it would've been me against the boulders of the Cirque. Tell me a bit about climbing Poumaka on the island of Ua Puo—the scary moments and the low moments. There were some really bad, low moments for me. I never became numb to my fear—I was scared from the moment Mike decked to the very end when we were back on the ground. There was a very healthy level of fear. I'd never belayed anyone on aid before, and I'd never climbed with Mike before this trip. Mike says you belayed him really well. Mike decked in the first ten minutes of starting up. And then, on the second pitch, he blew a piece right off the anchor and dropped right back down. So those were the first two pitches. I didn't know what was going on. I had a death grip on the rope the entire time I was belaying. Even when I ate, I tied him off and ate really quick and grabbed the rope again. How did you prepare for the tower? I learned how to jumar before I went. I was learning on the fly the entire time. Mike was really the teacher. Did you lose bouldering strength on that trip? My bouldering did suffer. I left two days after Nationals and was in really good shape for it. I did well at the comp and didn't boulder for three weeks on that trip—I just jugged lines. You're a pro climber, but climbing with Mike, you're put in a position as a pupil. How did that feel? It's very intimidating to be picking up this new skill set. I kind of felt like, wow, what did I do to deserve to go on this amazing trip with Mike? I have no skills, and he'll teach me the whole time. It's because he's so generous and so unique. He said things would be simpler and less intense in the future, and I trust that he's right. At one point on the trip, he said it was more challenging than being in Antarctica—the wetness wears you down. How did it feel to go into the unknown? Entering the unknown is not natural to me. It's been brought out because of these trips. In my family, I'm the black sheep—I didn't follow that path. As a climber, I'm not that crazy or adventurous. I'm an over-thinker, very analytical. Back to the trip—did your emotions swing all over? Did part of you transform? It was really cool in the end. I got exactly what you are talking about—I was angry and I didn't want to keep going and was done, and that last pitch was a pivotal moment. I had my own battle to go through. 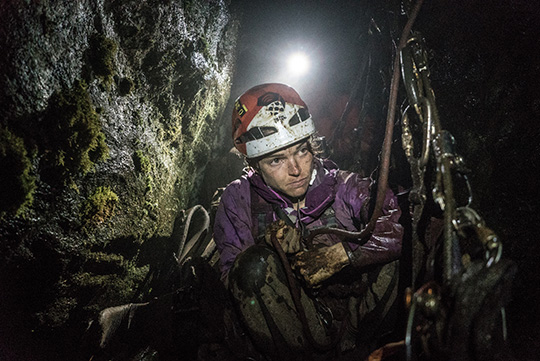 Keith turned the camera on me and we were in this disgusting notch of mud in this cave, and it was raining and we'd been up there forever. I was over it. I was being a sour puss. I collapsed into this puddle of emotion and cried. Then there was this definitive moment on the radio, and I didn't want to go up. Mike gently said, "Someone has to clean this pitch." It worked, and I had this surge of confidence. There was a drastic change of emotion. I went from hating life to being ecstatic. It was in that place where I wanted to move forward but really didn't want to. It was powerful for me. Have you often thought back to what you learned on the wall? Do you apply the skills you learned to other situations? I've revisited it a lot since then and thought about it. I wanted to surf in San Diego—I'm scared of the ocean. I got out there and was really scared and I thought back to the jungle and that last pitch. But I couldn't make it work—I'm too scared of the ocean and got mad that I couldn't do it. I wanted to be like I was at the top of that tower and to feel that triumph over my fear—it happens; it happened in the jungle. It's pretty special when it does. But just because I got over my fear once doesn't mean I'm not scared of things. Here at Alpinist, our small editorial staff works hard to create in-depth stories that are thoughtfully edited, thoroughly fact-checked and beautifully designed. Please consider supporting our efforts by subscribing. Login with your username and password below. New User? Here's what to do.